● When handling fuel, comply with the safety regulations displayed by garages and filling stations. ● Before removing the fuel cap, be sure to get rid of your body’s static electricity by touching a metal part of the car or fuel pump. Any static electricity on your body could create a spark that ignites fuel vapour. ● Perform the whole refuelling process (opening the fuel tank filler door, removing the fuel cap, etc.) by yourself. Do not let any other person come near the fuel tank filler. If you allowed a person to help you and that person was carrying static electricity, fuel vapour could be ignited. ● Do not move away from the fuel tank filler until is finished. If you moved away and did something else (for example, cleaning your windscreen) part-way through the refuelling process, you could pick up a fresh charge of static electricity. ● If the tank cap must be replaced, use only a MITSUBISHI MOTORS original part. 1. Before filling with fuel, stop the engine. 2. The fuel tank filler is located on the rear left side of your vehicle. 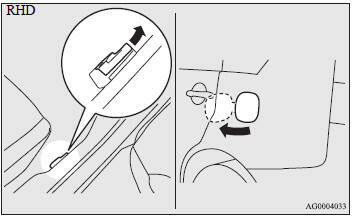 Open the fuel tank filler door with the release lever located the side of the driver’s seat. 3. Open the fuel tank filler tube by slowly turning the cap anticlockwise. ● Since the fuel system may be under pressure, remove the fuel cap slowly. This relieves any pressure or vacuum that might have built up in the fuel tank. If you hear a hissing sound from the cap, wait until it stops before removing the cap. Otherwise, fuel may spray out, injuring you or others. ● Do not tilt the gun. 5. When the gun stops automatically, remove the gun half the way in the tank port. After the second automatic stop, do not fill with fuel any more. 6. To close, turn the fuel cap slowly clockwise until you hear clicking sounds, then gently push the fuel tank filler door closed.